Discussion in 'Late Bay Classifieds' started by foe, Jan 23, 2019. We've had this bus for 10 years and in that time she's taken us everywhere. So with baby number 4 on the way and now buying our first house. The bus sadly and regrettably has to go. 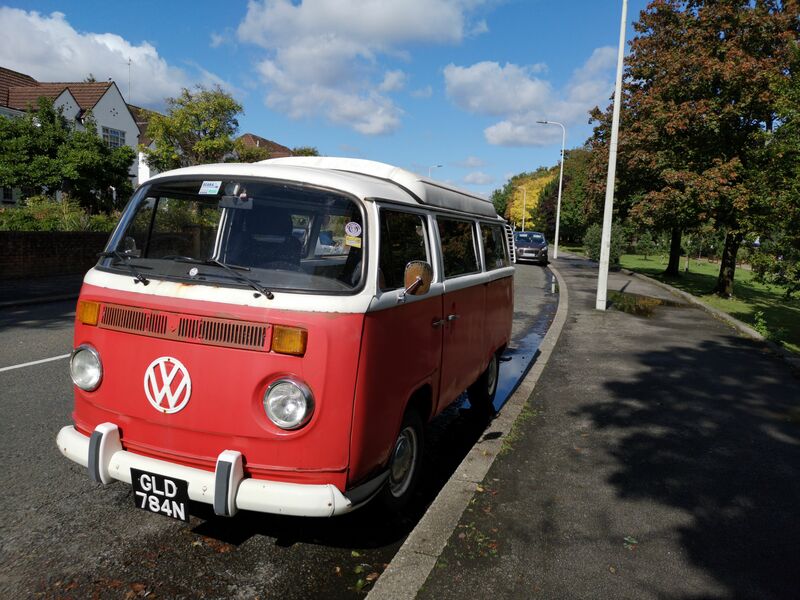 So with summer around the corner, why not start buying your festival tickets now ready to tour in a red and white VW camper! She is camping ready and waiting to be enjoyed! Just needs a new family for her. She's a late bay, built in October 1973 registered in March 1974, is TAX and MOT exempt. She is a Danbury conversation, converted by the previous owner. The pop top is high and gives ample head room. She sleeps 3, double rear rock and roll bed and up front a hammock, which will be included in the sale along with a 4 birth drive away Royal Travler awning. Also include will be the figure of eight to attach the awning to the bus. There is loads of room to store your various camping assesories, including a over head locker and a narrow rear cupboard. Along the driver's side is where the cooker is and again various compartment. There's even a secret cellar to keep beers and win chilled. The rock and roll bed lifts up to house more storage and this is where the amp and fuse box is housed. She has early front and rear bumpers with overriders and a early large front VW badge. The engine was recently built June 2018, with a 1776cc, which was fitted in July 2018. An external oil filter fitted, Solex 34pict 3 carb, rebuilt and jetted with a 132.5 main jet and a 120z air correction jet, which compliments the engine perfectly. I must say that having a 1776 is the best thing I ever did to this bus, as it hits the hills so much better! Cornwall was no problem. Drive away awning and a front hammock, my daughter loved it. Gas bottle for the original fellows fitted grill and twin hob. Electric hook up via a RC unit to a twin plug socket, electric hook up cable also included. 2 cigarette charging points, via a lesuire battery, a Sony amp which powers two vibe speakers via a Sony face off unit discretely hidden inside the front glove box. Levelling chocks to level the bus out. Underneath the rear overhead locker is a table which fits into the units to sit 4 people, Passenger Captain chair spins around. The rear passenger side has a proper 3 point seatbelt which was fitted for the children's car seats, the middle is a lapbelt. She will also come with all the curtains, already fitted, and pillows. Also a clothes line which hangs from the front window and a bucket BBQ. I'll also add some folding chairs and a fold away carbon flag pole! So you can find her when returning from a festival. The interior has been insulated. Rear CV joints replaced, the whole rear valance and corners have been cut out and replaced! Fuel lines and filler neck rubber replaced. When engine was out painted the engine bay red with rustoleum, which is also the same as the bus. Original Heat exchangers, which work and blow out hot! However you need to zip tie to keep open. Hot air comes out of either through the dash tops to demist the window or through the totem pole for warm feet. Please note, she is a family bus and is used for her function and she does this so well, so I want to make you aware of the following and as a result is reflected in the price. She does have rust scabs and bubbles here and there in places, including the top of the rear roof near the gutter, but does not effect anything structurally! Some of the paint is flaking at the front, and you can see where welding has taken place. The rear engine lid locks, but has some rust scabs and so does the front clip. The front off side arch has rusted, but I have a whole original spare arch, from a dry VW American bus, which will be included, this did not affect the last MOT. I also have two rear arch repair panels, as the offside lip needs welding. There is a rust hole on the nearside front bumper. She will come with a mass of spares, I've ammassed over the years I've owner her including, gaskets, tools including advanced timing light, solex carbs, original full front near side door, current one rusted at the bottom only, two original fuel pumps, front brake pads, VW manual, front dash, repair panels, and a lot more, which I can't recall, but all the things you may need. I have 2 folders of receipts spanning the time I've owned her including work done. I've tried to recall everything I can, so please, please let me know if there are anything you want to know. As I've said she is ready to go and only needs a family! This is a forced sale due to house move and a new baby, and not something I ever thought I would have to do. Not many, if any buses ready to go at this price including all the extras. Viewings will have to be with notice so my 3year old daughter is not there, as she's going to be heartbroken. This awning is included. The rear bumper is now on! Can I ask where you got the new jets for the carb from? Thank you. The jets where from Gower and Lee. Things moving along quickly! 9 weeks left until the birth and offer on the house accepted! I'm open to "on nearest offers" for the bus. Moving in date end of February!! Pease come and see this bus, bring your friends, your mechanic, you're family!! andysn and Merlin Cat like this. Good luck with new house and baby. You can come on here for a breather! foe and Jack Tatty like this.